FEATURES/SPECS A great gift for people who use their brains instead of brawn to make a living, this inspirational desk sculpture features the text: "Thinking out of the box - Only those who see the invisible can do the impossible." 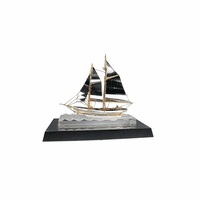 It features a nickel finish plate on a semi-gloss mahogany finish base. 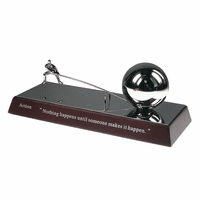 A nickel finish figurine perched above it on one end of a balancing bar, with a ball on the other end. This bar rotates like a see saw with a tap on the ball. Add a personalized touch with a laser engraved plate mounted on the back of the wood base. Just check the Personalize It box above to enter instructions. This personalized Thinking out of the box desk stand comes packaged in a gift box and ships out the next day. Could I leave the original engraving on the item but inscribe the person's full name on the other side of it? Yes, the text on the front comes pre-printed on this desk sculpture. The personalization you enter will be laser engraved on a silver plate on the back. Can you personalize it on more than one side? How long does it take to personalize and order? Its normally personalized by adding an engrving plate to the back. The text on the front comes with the product. If you'd like to add a plate to either side, or both sides, we could do that for you. If you'd like that, just let us know in the comments section of our checkout page, after you add this to the shopping cart. Hi Anta, Yes, the logo will be no problem and we can have it shipped out within a day or two. What country are you shipping to? I love the included quote "See the invisibility". Can I have that along with a personalized name on another plate, like on the opposite side? Sure, we'd be happy to do that. Just check the Personalize box above and you'll be able to enter personalization instructions. The instructions you enter will be engraved on a plate and mounted on the back of the wood base. Are you able to ship to Mexico City? No, sorry, we are not able to ship to Mexico right now as our shipments didn't seem to be arriving there via USPS international air mail. Our Mexican customers were not receiving their packages. If you need a large order, we might be able to arrange UPS shipping, just let us know. We do ship to Australia but only on smaller items. This Inspirational is a little too large, sorry! We can ship to Bulgaria, just choose USPS International Air Mail as your shipping method. Shipping usually takes 2 to 3 weeks for international orders. The engraving is mounted on a plate on the back side of the base of the statue. It does not go on the bottom. 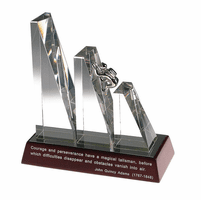 the engraving is free of charge, and you can engrave 3 lines of up to 25 characters per line. We do have to quote a price upon shipment but we make it as low as possible for customs. Hi, i have a question: i want to buy exactly the one showing on the picture with the same text. Do i have to put that text in engraving lines, or it's included? Also, how much is the shipping to Russia and how long does it take? Thanks. The text shown comes with this item. You can just add it to your shopping cart and checkout. The shipping to Russia would be $11.95. 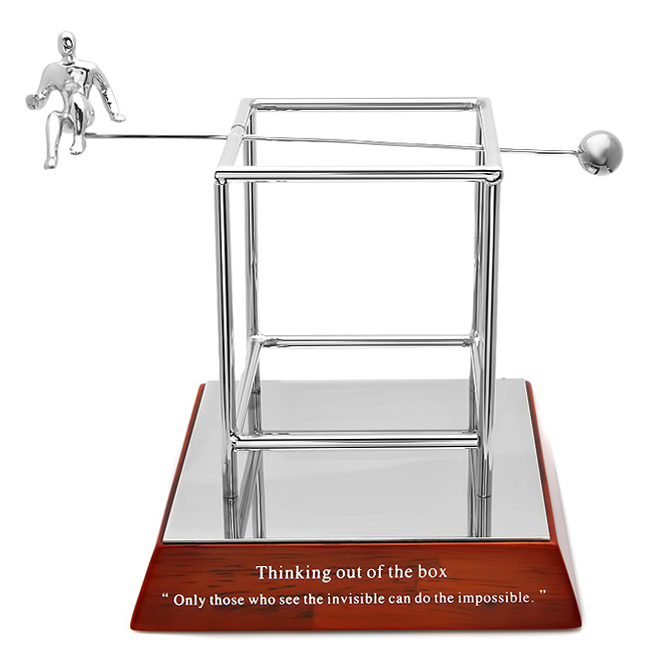 "Thinking outside the box" was a great gift. Very happy with the quality and personal engraving. Delivery was as promised as well too. I definitely would order again from this company in the future. I was searching for something completely different and kept coming up with the same kind of gifts, until i ran into this gem. I'm very happy with the outcome! After reading some reviews i thought i was going to be way too small, but it was perfect for someones desk! I was also impressed with how fast customer service answered my questions!! Great product and service! To order was easy . It shipped very quickly . It arrived as described . Perfect gift for anyone and so very nice to be able to personalize . Great company to work with . I bought this to say thank you to a client of mine. The item is disappointing in terms of its size (pretty small) compared to its cost. My client kept trying to move the man in the figure but he doesn't move. Merchant Response:We're so sorry you're disappointed in the size, we do list the dimensions but we understand it can be difficult to picture. The man should absolutely move if you tap on the other end of the bar he sits on. We'll be happy to ship you a replacement, even a different item if you'd prefer free of charge. Just email us at help@executivegiftshoppe.com and let us know if you'd like a replacement of the same item or a different item. 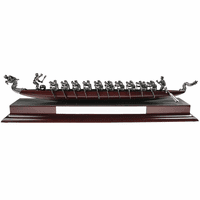 Its an awesome piece; made of good quality materials and looks classy on the desk. Shipped on time. 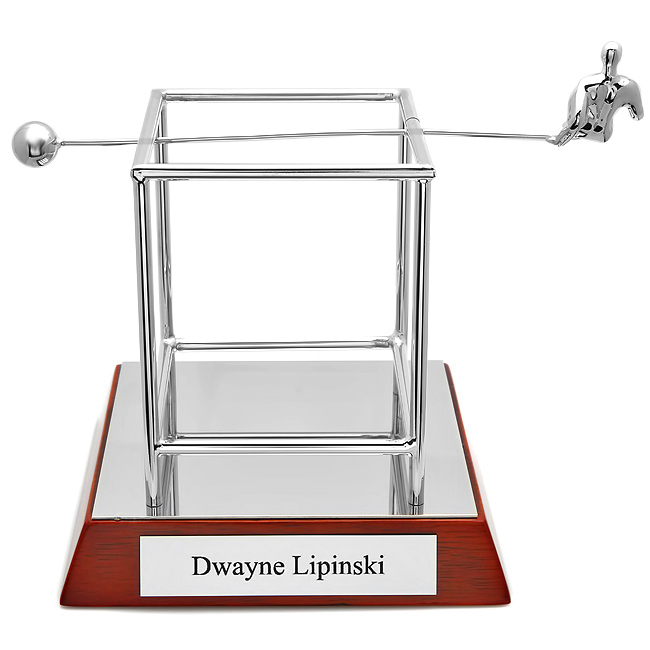 Ordered this sculpture for a college gradutaion gift. Was received in plenty of time and beautifully boxed. The recipient was as please as I was as the purchaser. The desk sculpture ordered was recieved in excellent condition! The packaging was more than anticiapted, and the product itself! a winner! So, on time for arrival, exceeded expectations, professional follow up... all in all an excellent item by a dedicated provider.